Idiopathic pulmonary fibrosis (IPF) is defined as a specific form of chronic, progressive fibrosing interstitial pneumonia of unknown etiology, occurring primarily in older adults, limited to the lungs, and associated with the histopathologic and/or radiologic pattern of usual interstitial pneumonia (UIP). It is characterized by progressive worsening of dyspnea and lung function and is associated with a poor prognosis; most patients die of respiratory failure. The mean survival is approximately 4 years. All known causes of interstitial lung disease (ILD) are excluded, including other idiopathic interstitial pneumonias and ILD associated with environmental exposure, medication, or systemic disease. A UIP pattern is present on high-resolution computed tomography (HRCT) in patients not subjected to surgical lung biopsy. Radiologic characteristics of pulmonary fibrosis appear in the image below. HRCT of advanced stage of pulmonary fibrosis demonstrating reticular opacities with honeycombing, with predominant subpleural distribution. The diagnosis is confirmed with a lung biopsy, but the histology shows striking variation from one region to the next (ie, the disease is characterized by histologic temporal and spatial heterogeneity). It is not unusual to find areas of normal lung next to areas with severe thickening of alveolar walls. Therefore, findings on bronchoscopic or percutaneous lung biopsy are difficult to interpret. Open lung biopsy and video-assisted thoracoscopic lung biopsy are the preferred methods. IPF usually affects patients 50-70 years of age. Most series report a male preponderance, with a male-to-female ratio of 2:1. Clinical features consist of progressive exertional dyspnea; the presence of interstitial infiltrates, as evidenced on chest radiographs; and physiologic evidence of restriction and impaired gas exchange on pulmonary function testing. Patients are generally treated with corticosteroids, other immunosuppressants, or both. 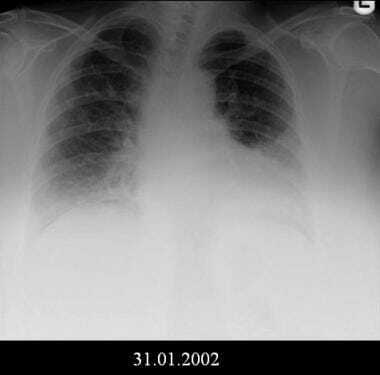 Plain chest radiography is usually the first investigation performed for patients with suspected interstitial lung disease. However, the findings on conventional radiography are highly nonspecific. High-resolution computed tomography (HRCT) scanning defines the underlying lung parenchymal abnormalities better than plain radiography. [5, 6] Studies have shown that HRCT may obviate surgical lung biopsy in some patients. Raghu et al compared the diagnostic accuracy of clinical evaluation in combination with HRCT with the accuracy of histology of surgical lung-biopsy samples. Clinical assessment in conjunction with careful review of HRCT scans was 60% sensitive and 97% specific for IPF. However, although HRCT may obviate the need for tissue diagnosis in 60% of patients, surgical lung biopsy is still needed in 40%. For diagnoses other than IPF, a combination of clinical assessment and HRCT is neither sensitive nor specific enough to be relied on without surgical biopsy. Open lung biopsy remains the criterion standard. In immunocompetent patients, the benefit is relatively low because corticosteroid therapy is frequently administered after biopsy. In immunocompromised patients, approaches to therapy change substantially after tissue confirmation, but mortality is high. Therefore, open biopsy should be performed only in patients in whom the diagnosis is likely to change therapy and in patients who have a reasonable prognosis. Radionuclide scanning with gallium-67 may depict interstitial fibrosis and may show changes early. This feature may be of therapeutic benefit, but the changes are nonspecific and do not remove the need for lung biopsy. Bilateral lower lobe opacities and possible mild decrease in lung volumes. Courtesy of Sat Sharma, MD, FRCPC, FACP, FCCP, DABSM. Peripheral accentuation is also a common feature, but it is more easily appreciated on CT scans than on plain chest radiographs. The pattern is usually symmetrical. Another common pattern is hazy, ground-glass opacification, which is either diffuse or patchy. Volume loss and a raised diaphragm are seen in up to 60% of patients. This may be accompanied by basal discoid atelectasis. Pleural disease is not typical of IPF. Its presence should raise the possibility of other conditions, such as asbestosis, rheumatoid pulmonary disease, or systemic lupus. Pneumothorax, pneumomediastinum, or both have been reported in a few patients; these conditions have been associated with bullae in the lung parenchyma. With progression of alveolitis to fibrosis, the initial fine lines become coarse, and small (2 mm) cysts appear. These cysts coalesce and increase to 5-7 mm in diameter; they appear as ring opacities within the honeycomb lung. As fibrosis worsens, the honeycombing becomes coarser with larger honeycomb cysts, and further volume loss occurs. In advanced stages, there is radiographic evidence of pulmonary arterial hypertension. The radiographic findings are not correlated with the stage of the disease, the histology, the respiratory symptoms, the respiratory function tests, or the prognosis. In the majority of patients with IPF, the chest radiograph is abnormal at presentation; previous radiographs often will have shown reticular shadowing, even before symptom development. Chest radiography is frequently the first investigation employed for patients with IPF; physiologic testing and HRCT scanning follow. For symptomatic patients in whom the diffusion capacity is abnormal, results of chest radiography may be normal. For other patients, the radiographic appearances are abnormal before clinical symptoms appear. Results of HRCT scanning are abnormal for most patients with IPF. High-resolution CT (HRCT) shows increased pulmonary attenuation with distortion of the pulmonary architecture. Courtesy of Sat Sharma, MD, FRCPC, FACP, FCCP, DABSM. High-resolution CT (HRCT) shows distortion of the pulmonary architecture with thickening of pulmonary interstitium and some areas of ground-glass attenuation. No obvious honeycombing is present. Courtesy of Sat Sharma, MD, FRCPC, FACP, FCCP, DABSM. On HRCT, IPF is commonly characterized by patchy and predominantly peripheral, subpleural, and bibasilar reticular opacities. The distribution is predominantly posterior. It is often associated with traction bronchiectasis and subpleural honeycombing. 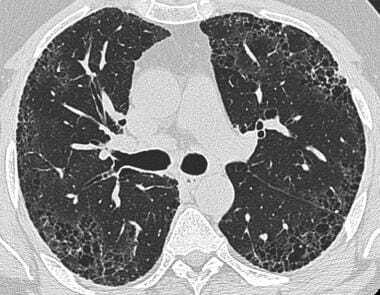 In cases of suspected IPF in which lung HRCT shows more than 30% ground-glass attenuation, consideration should be given to other diagnoses; alternative diagnoses include desquamative interstitial pneumonitis, idiopathic bronchiolitis obliterans organizing pneumonia, respiratory bronchiolitis–associated interstitial lung disease, hypersensitivity pneumonitis, and nonspecific interstitial pneumonia. In cases of IPF, perfusion lung scintigraphy shows nonspecific, subsegmental mismatched perfusion defects. These are not correlated with clinical severity. What are the diagnostic criteria for idiopathic pulmonary fibrosis (IPF)? How is the diagnosis of idiopathic pulmonary fibrosis (IPF) confirmed? Which patient groups are at highest risk for idiopathic pulmonary fibrosis (IPF)? Which medications are used to treat idiopathic pulmonary fibrosis (IPF)? What is the role of radiography in the workup of idiopathic pulmonary fibrosis (IPF)? How accurate are radiographic findings in the diagnosis of idiopathic pulmonary fibrosis (IPF)? What is the role of CT scan in the workup of idiopathic pulmonary fibrosis (IPF)? What is the role of nuclear imaging in the workup of idiopathic pulmonary fibrosis (IPF)? [Guideline] Raghu G, Collard HR, Egan JJ, et al. An official ATS/ERS/JRS/ALAT statement: idiopathic pulmonary fibrosis: evidence-based guidelines for diagnosis and management. Am J Respir Crit Care Med. 2011 Mar 15. 183 (6):788-824. [Medline]. [Full Text]. Pipavath S, Godwin JD. Imaging of the chest: idiopathic interstitial pneumonia. Clin Chest Med. 2004 Dec. 25(4):651-6, v-vi. Strollo DC. Imaging of idiopathic interstitial lung diseases. Concepts and conundrums. Am J Respir Cell Mol Biol. 2003 Sep. 29(3 Suppl):S10-8. [Medline]. Kishaba T. Practical management of Idiopathic Pulmonary Fibrosis. Sarcoidosis Vasc Diffuse Lung Dis. 2015 Jul 22. 32 (2):90-8. [Medline]. Oikonomou A. Role of imaging in the diagnosis of diffuse and interstitial lung diseases. Curr Opin Pulm Med. 2014 Sep. 20 (5):517-24. [Medline]. Raghu G. Idiopathic pulmonary fibrosis. A rational clinical approach. Chest. 1987 Jul. 92(1):148-54. [Medline]. Johnston ID, Prescott RJ, Chalmers JC, Rudd RM. British Thoracic Society study of cryptogenic fibrosing alveolitis: current presentation and initial management. Fibrosing Alveolitis Subcommittee of the Research Committee of the British Thoracic Society. Thorax. 1997 Jan. 52(1):38-44. [Medline]. Grenier P, Valeyre D, Cluzel P, et al. Chronic diffuse interstitial lung disease: diagnostic value of chest radiography and high-resolution CT. Radiology. 1991 Apr. 179(1):123-32. [Medline]. Antonio GE, Wong KT, Hui DS, et al. Thin-section CT in patients with severe acute respiratory syndrome following hospital discharge: preliminary experience. Radiology. 2003 Sep. 228(3):810-5. [Medline]. MacDonald SL, Rubens MB, Hansell DM, et al. 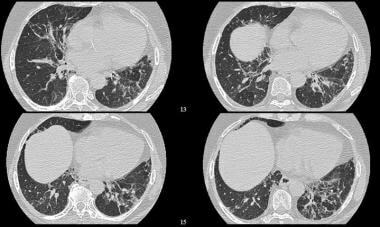 Nonspecific interstitial pneumonia and usual interstitial pneumonia: comparative appearances at and diagnostic accuracy of thin-section CT. Radiology. 2001 Dec. 221(3):600-5. [Medline]. 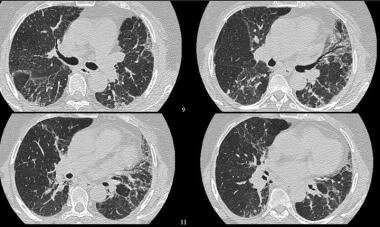 Potente G, Bellelli A, Nardis P. Specific diagnosis by CT and HRCT in six chronic lung diseases. Comput Med Imaging Graph. 1992 Jul-Aug. 16(4):277-82. [Medline]. Raghu G. Interstitial lung disease: a diagnostic approach. Are CT scan and lung biopsy indicated in every patient?. Am J Respir Crit Care Med. 1995 Mar. 151(3 Pt 1):909-14. [Medline]. Shah RM, Miller W. Widespread ground-glass opacity of the lung in consecutive patients undergoing CT: Does lobular distribution assist diagnosis?. AJR Am J Roentgenol. 2003 Apr. 180(4):965-8. [Medline]. Wells A. Clinical usefulness of high resolution computed tomography in cryptogenic fibrosing alveolitis. Thorax. 1998 Dec. 53(12):1080-7. [Medline]. Wittram C, Mark EJ, McLoud TC. CT-histologic correlation of the ATS/ERS 2002 classification of idiopathic interstitial pneumonias. Radiographics. 2003 Sep-Oct. 23(5):1057-71. [Medline]. Zompatori M, Calabrò E, Chetta A, et al. [Chronic hypersensitivity pneumonitis or idiopathic pulmonary fibrosis? Diagnostic role of high resolution Computed Tomography (HRCT)]. Radiol Med (Torino). 2003 Sep. 106(3):135-46. [Medline]. Song JW, Koh WJ, Lee KS, Lee JY, Chung MJ, Kim TS, et al. High-resolution CT findings of Mycobacterium avium-intracellulare complex pulmonary disease: correlation with pulmonary function test results. AJR Am J Roentgenol. 2008 Oct. 191(4):1070. [Medline]. Piirilä P, Kivisaari L, Huuskonen O, Kaleva S, Sovijärvi A, Vehmas T. Association of findings in flow-volume spirometry with high-resolution computed tomography signs in asbestos-exposed male workers. Clin Physiol Funct Imaging. 2008 Sep 15. [Medline]. Rogliani P, Mura M, Mattia P, Ferlosio A, Farinelli G, Mariotta S, et al. HRCT and histopathological evaluation of fibrosis and tissue destruction in IPF associated with pulmonary emphysema. Respir Med. 2008 Aug 22. [Medline]. Petroulia V, Funke M, Zumstein P, Berezowska S, Ebner L, Geiser T, et al. Increased Expiratory Computed Tomography Density Reveals Possible Abnormalities in Radiologically Preserved Lung Parenchyma in Idiopathic Pulmonary Fibrosis. Invest Radiol. 2018 Jan. 53 (1):45-51. [Medline]. Mai C, Verleden SE, McDonough JE, Willems S, De Wever W, Coolen J, et al. Thin-Section CT Features of Idiopathic Pulmonary Fibrosis Correlated with Micro-CT and Histologic Analysis. Radiology. 2017 Apr. 283 (1):252-263. [Medline]. Salisbury ML, Xia M, Murray S, Bartholmai BJ, Kazerooni EA, Meldrum CA, et al. Predictors of idiopathic pulmonary fibrosis in absence of radiologic honeycombing: A cross sectional analysis in ILD patients undergoing lung tissue sampling. Respir Med. 2016 Sep. 118:88-95. [Medline]. [Full Text]. Shin S, King CS, Puri N, Shlobin OA, Brown AW, Ahmad S, et al. Pulmonary artery size as a predictor of outcomes in idiopathic pulmonary fibrosis. Eur Respir J. 2016 May. 47 (5):1445-51. [Medline]. [Full Text]. Kataoka M, Kawamura M, Ueda N, et al. Diffuse gallium-67 uptake in radiation pneumonitis. Clin Nucl Med. 1990 Oct. 15(10):707-11. [Medline]. Labrune S, Chinet T, Collignon MA, et al. Mechanisms of increased epithelial lung clearance of DTPA in diffuse fibrosing alveolitis. Eur Respir J. 1994 Apr. 7(4):651-6. [Medline]. Baughman RP, Fernandez M. Radionuclide imaging in interstitial lung disease. Curr Opin Pulm Med. 1996 Sep. 2(5):376-9. [Medline]. Bourke SJ, Hawkins T, Keavey PM, et al. Ventilation perfusion radionuclide imaging in cryptogenic fibrosing alveolitis. Nucl Med Commun. 1993 Jun. 14(6):454-64. [Medline]. James JM, Lloyd JJ, Leahy BC, et al. 99Tcm-Technegas and krypton-81m ventilation scintigraphy: a comparison in known respiratory disease. Br J Radiol. 1992 Dec. 65(780):1075-82. [Medline]. Rizzato G. Is nuclear imaging of any value in managing interstitial fibrosis?. Curr Opin Pulm Med. 1997 Sep. 3(5):372-7. [Medline]. Simkin PH, Licho R, Brill AB. Pulmonary nuclear medicine. Curr Opin Radiol. 1991 Dec. 3(6):859-70. [Medline]. Win T, Lambrou T, Hutton BF, Kayani I, Screaton NJ, Porter JC, et al. 18F-Fluorodeoxyglucose positron emission tomography pulmonary imaging in idiopathic pulmonary fibrosis is reproducible: implications for future clinical trials. Eur J Nucl Med Mol Imaging. 2012 Mar. 39(3):521-8. [Medline].